Airbridges slow boarding and disembarking because (normally) there's only one door in use. But... why? Now the most obvious reason would be that it's very easy to have the aircraft pull forward until its door is roughly in line with the bridge, while it's not possible to do that at the back as well, given the differences in fuselage length. Sure, but I suspect that 90% of all aircraft could be serviced from a set of two possible bridge locations and the existing bridge movement range. And then one notes that the wing would be an issue, but that's only true if the bridge is in the air. One could just as easily build a "bridge" on the surface, or even underground (I saw a cross-section of the ramp at Pearson, it was like swiss cheese). Of course that would mean walking down stairs, which is one of the reasons you use a bridge in the first place, but it would mean that anyone with normal capabilities could use it without exiting outside (did that at Pearson too, in the middle of winter). Such a system would have the added advantage of allowing the Spanish Solution, with three waves, the middle being the cleaning crew. It was tested at Denver airport by United for a few years ultimately the project was scraped due to jet bridge malfunction that lead to wing damage. The deciding factor arose out of an incident where one of the bridges malfunctioned and damaged the wing of Boeing 757, as ANN reported in March. United removed the section that failed, and stopped using the over-the-wing part on the other four bridges. Side parked dual jet bridge terminals did exist in the early jet age but don't appear to be a great use of space and I cant find any evidence they allowed faster board speeds back then. Taxi in and out would always require quite a bit of bridge retraction and a careful tight turn. 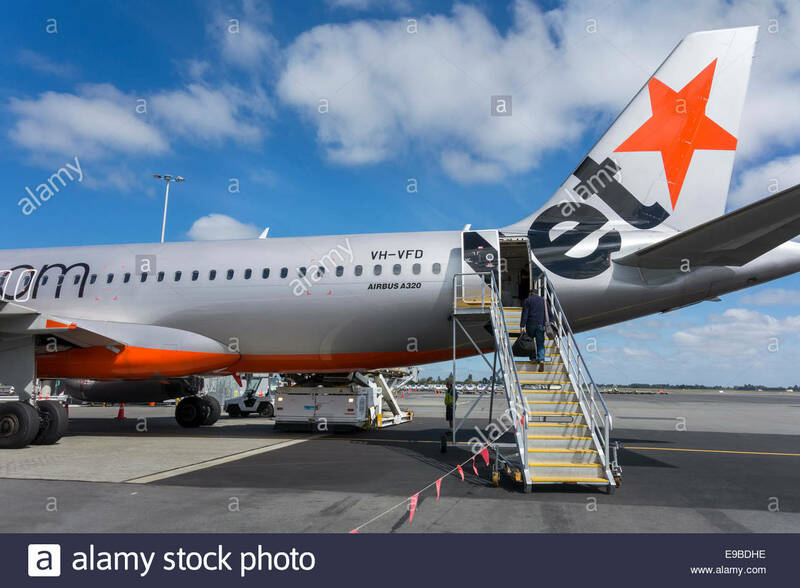 In a lot of cases the rear of the aircraft is used to load on the new food and remove old garbage blocking the rear with exiting and entering passengers could get in the way of the operations during fast turn arounds. As you note you could always go under the wing and come back up. 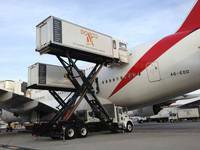 In areas where inclement weather is common you would need the ability to keep the whole jetway enclosed. This could get in the way of the wing unless it was either very low or underground, you would then need some form of retractable stair on the end. 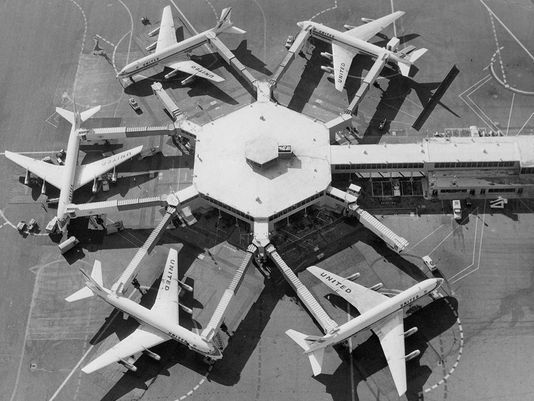 All in all it could be built but thats a lot of complexity to add into an airport ramp. This means down time for the gate and money lost for the airport. Depending on arrangement the tunnel may also need to be strong enough to support what ever is above it (vehicles, aircraft etc). Some airlines do this all the time, as in the picture below. The front boarding may be a jetway, or may also be stairs, depending on where the aircraft is parked. The passengers in the front half of the aircraft board at the front, and the passengers in the back half board at the back. Boarding at the back involves going down stairs, walking on the tarmac, and climbing the stairs pictured here, so they will seat passengers who can't do those things by themselves in the front half of the plane. Back when Mirabel airport in Montreal (YMX) was still used for international passenger flights, they used "Passenger Transfer Vehicles" (PTVs - like at Dulles) instead of airbridges. It wasn't unusual to see two of them latched to the sides of a large aircraft. I've also seen two airbridges attached to two front doors of wide body jets. The front-most one serving first-class and the far aisle of the plane, and the other the close aisle. Not the answer you're looking for? Browse other questions tagged airport-design or ask your own question. Why aren't planes loaded from both ends? Are flexible pavements not recommended in hot climates?